If you’re looking for our Winn Dixie hot deals posts or any other Winn Dixie Couponing Topics, be sure to start from our Winn Dixie Couponing Category page and navigate the Winn Dixie coupon topics on the tabs. You can also view all other store matchups from the main menu. 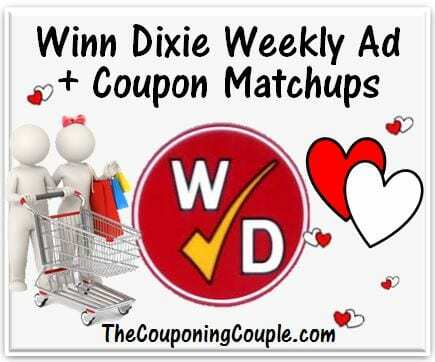 If you are looking for a WinnDixie Weekly Ad Matchup below, pay attention to the dates. These are all the past, current and future Winn Dixie ad coupon matchups. Once you click on the ad, you will see the sale item/promotion and possible coupons and rebates that match. If you haven’t tried the printable shopping list yet, be sure to check that out. You can keep adding to your shopping list from any of the WinnDixie Coupon Matchups lists or hot deal lists and then print or email it to yourself when you’re ready to shop. For complete WinnDixie Couponing Info, go to the WinnDixie Couponing Category.